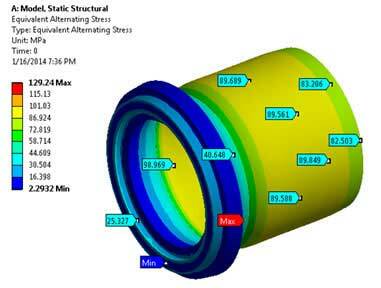 The finite element analysis to estimate fatigue lifecycle of the valve component was performed. The results based on the S-N curve showed that the valve component design was found to be safe for 14000 pressure loading cycles. Control valves in process industries are often subjected to cyclic pressure loadings causing premature failure, leading towards frequent replacement. As such, designing the valves require considering the effects of fatigue loading cycle to evaluate its lifecycle. Process equipment manufacturer from India approached Hi-Tech to seek assistance in evaluating the design of their newly developed valve component subjected to internal pressure loading cycles using simulation techniques. The valve component was analyzed using finite element method to determine the structural strength against the internal pressure loading. 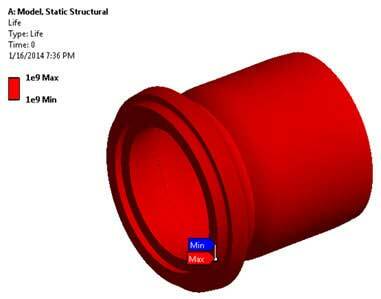 In order to assess the fatigue lifecycle, the data from the S-N curve for the component material was utilized. The results showed that the mean stress value during 14000 pressure loading cycles was well within the acceptable range. Hence, the valve component design was predicted to behave safe during the expected lifecycle without premature failure.